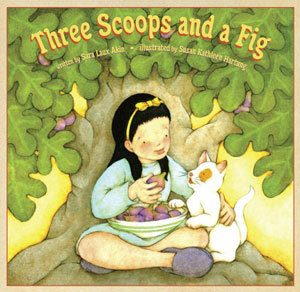 Three Scoops and a Fig by Sara Laux Akin, illustrated by Susan Kathleen Hartung. Peachtree, Atlanta Georgia, 2010. But all is not lost. A chance encounter with a fig tree helps Sophia invent a new dessert just in time for her grandparent’s arrival. Laux Akin’s spare but effective prose and Hartung’s watercolor illustrations bring Sophia’s Italian family to life. The story will resonate with any young child who wants to be grown up and help, but is told “you are too little to help!” The satisfying ending will reassure her that, like Sophia, her time to help will come.